You know it’s a crummy day for riding when I resort to amusing myself by trolling through Craigslist. Rarely am I surprised by what sort of horse-related stuff is being offered for sale in my region. Let’s start with the horse ads, shall we? Forthright honesty is admirable in the horse world, but sometimes it’s best to choose your words carefully, lest you scare off potential buyers. For example, wouldn’t it have been better to describe an aged palomino as having some special needs instead of bluntly volunteering that he was “swaybacked since birth and blind in one eye”? Every three months… or so?! How about just going for it and getting them trimmed annually? I also like the curious misspelling of words and the creation of new words. For instance, I clicked on an ad for a “small black gilling.” Turns out it was not a rare species of flounder but a small black GELDING. “Famal”? Hmmm… What did they really mean to say? Did they mean the horse was… familiar? With what? Cattle? Barking dogs? Is he familiar with the farrier? The vet? Or did they mean to write “he is family”? But is he family like my sweet Uncle Nate or family like my mean cousin Tommy? But no. 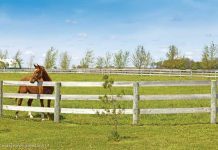 When I clicked on the full ad there was a photo of a pile of crusty steel water troughs, the ones you put in a horse pasture: Old metal horse troughs. (Apparently the seller missed the phonics lesson dealing with the “f” sound at the end of that word). Oh look! 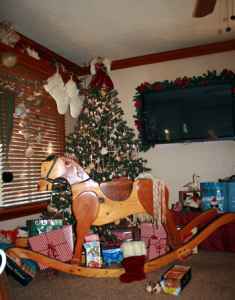 Santa brought Daddy his very own rocking horse! Okay. That’s enough Craigslisting for today. I’m going to keep my fingers crossed that the weather is better tomorrow so I can do something productive. Like ride a real horse. Hehe, I like the rocking horse, boasting about being able to hold a 250 lb man…..CREEPY! I have a bay gilling ha! Very funny. Craigslist is always a great source of laughs, confusion, and frustration of horseownerships. This is so funny…and so true! Too funny. Anyone know where I can find more good “horsey” blogs?